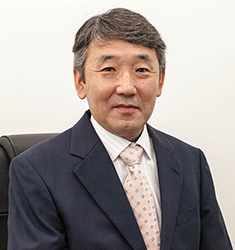 President Message | OKAYA SEIKEN Co.,Ltd. Since its establishment in 1963, Okaya Seiken Co., Ltd., has advocated "a challenge to the impossible" as a company precept to build relations of trust with customers, continuing the three challenges of productivity improvement, high quality/high technology/high skills, and prompt delivery. Thinking about how to do rather than finding reasons for inability, doing away with stereotyped ideas about manufacturing methods, and fixing errors at once--employees possessing such a spirit of reform are honing their skills day by day. Furthermore, we are boosting productivity to promptly meet delivery time by operating 24/7.All employees are working together daily to supply products ranging from prototypes to super mass production items as de­anded by customers. The pursuit of high skills and persistence to product quality by each and every employee have enabled us to respond to rapid globalization, allowing monozukuri (manufacturing) abroad to get on track. Okayama Seiken will continue building relations of trust with customers and keep challenging in pursuit of "a company worthy of existence" from now on as well. We expect to continue efforts daily seeking to be a company closely connected to local communities so as to create jobs and make other contributions to regional society. We hope for your continued support and patronage.